My Alfa Romeo Spider S3 is now Sold… thanks for looking! So the time has come for me to sell my 1988 Alfa Romeo Spider S3. I had hoped to keep the car for a bit longer, but I need to focus my attention on my Bertone x1/9, my Mk3 Golf GTi and Vauxhall Viceroy. All need work. So it is a classic case of too many projects and it is time to move one on to refocus on the others. I feel I’ve ticked off a lot of items on the list with the Alfa and have taken it as far as I can. So I am passing it to the next person to continue it’s journey. If you are interested in this car drop me an email on hello@taketotheroad.co.uk. I strongly recommend viewing it. To start off the For Sale Listing, first I suggest you watch my videos about this S3 Spider on my Take to the Roads Garage Playlist of my YouTube Channel. This will show you all the work I’ve done on the car since I bought it in April 2017. Location wise, the car is not far from Ashford in Kent, I’m based between Ashford and Canterbury. As an introduction, I bought my Alfa Spider back in April 2017. I was looking for a project car and when I came across this S3 for sale, I had to go and take a look. Being a petrolhead I’ve always wanted an Alfa Romeo. Plus the second film I made for Take to the Road was with a rather special 1969 Alfa Romeo 1750 Spider Veloce. So of course I wanted to own a piece of that wonderful Pininfarina design, one that had a hand from the great Battista “Pinin” Farina himself. I knew this car needed some work but it looked solid, had an MOT and it drove nice. A deal was struck and I drove home with my first ever Alfa Romeo! This is a 1988 Alfa Romeo Spider S3 2000. 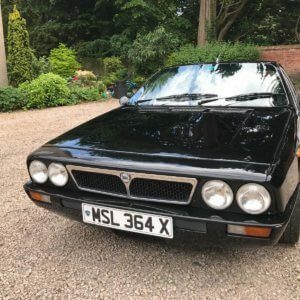 It is a RHD conversion carried out under license by Bell and Colvill in Surrey (who carried out many of the conversions on behalf of Alfa Romeo). It has the Alfa 2.0ltr twin cam engine which is mated to a 5 speed gearbox. 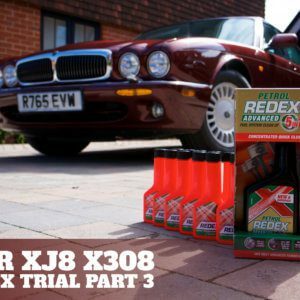 It is an 8 owner car and it has covered 130,846km which equates to 81,303 miles. The miles will go up slightly as I use it for sunny drives. It is fitted with a factory immobiliser which works. It also has two sets of keys with immobiliser fobs. From what I can gather the Spider was used regularly until 2010, when it was put away into storage. It was then brought out of storage in 2016 and has been in regular use since then. It comes with a decent history file with a lot of paper work and invoices. This include the original service book which has records until 2000. Also in the file is a receipt from an Essex based property developer (which is still in existence today), who sold the Spider on 21st April 1992 for £8,950. Which suggests it may have been a company car. After that there is paper work, invoices and hand written notes which suggests that the mileage is accurate. There are also two Alfa Spider owners manuals. Included with the history file is an Alfa Romeo Heritage Certificate, which I obtained from the Centro Documentazione Alfa Romeo in Milan. This shows that the Spider was built on the 16th December 1987. It was sold on the 5th of February 1988 with the destination noted as Nürnberg (aka Nuremburg) Germany. The Spider would then have been imported into the UK by Bell and Colvill of Surrey and the conversion to RHD was carried out by them. Alfa Romeo you see did not make a RHD version of the S3 Spider. So all S3 Spider RHD examples have been converted. It comes with a new MOT! There is an advisory for seeping from the steering box. My Alfa specialist said the area is a little wet but it is not a serious leak. And the steering boxes on these always leak a little. The MOT is until 17 July 2019. This Spider has been fitted with the more desirable Delorto DHLA 40 twin carbs, in place of the less desirable Solex pair (these do come with the car). Attached to the twin Delorto’s is a rare Colombo Tecni air filter. This replaces the much larger original Alfa air can filter (which also comes with the car). The result is a rather distinctive noise which produces a lovely warble from the engine. The Tecni filter is an Italian made air box which was installed on some Alfa’s back in the 1970s and 1980s. One corner or the air box casing needs repair. But apart from that it is in good shape. The filter has been cleaned and the filter gauze prepped with K&N air filter oil. Other items of note in the engine department are a radiator flush and refill with correct coolant for an aluminium engine. It holds a good temperature and remains steady at 80 degrees even after a spirited drive. The Alfa Spider was also treated to an oil change (using Duckhams Classic grade Q20W50 oil) and a new oil filter. This was done at 130,687km so not very long ago. Engine oil pressure is good. I also had Alfa specialist Autobritalia top up the gearbox oil and renew the diff oil. It is finished in what I would best describe as a metallic blue/green colour, which is called blu medio metallizzato in the heritage certificate. It is a very nice colour and it makes a change from the more common red Spiders that you see about. The paint on this Alfa Romeo Spider S3 is not perfect. Some areas a very good and some not so good. I have had a quote of £1,000 from a classic car body shop to fix the various areas which would really tidy up the appearance. There is some rust (it is an Alfa after all) but those areas are confined to the passenger sill, a small bubble on the front left wing bottom and patches on the underside of the bonnet. The scuttle panel corners also have rust. This panel can be taken out easily and the corners repaired. The lacquer is poor in some spots around the boot lid area. There is also a dent in the passenger wing, which was there when I bought it. This should pop out ok. Again it was on the list of body work repairs to do. The rest of the car though is very solid and it is very clean underneath with the all important chassis rails in good condition. The bumpers do have some scuffs but they are straight and can be redressed to bring them back to original shiny condition. A spare bonnet in Alfa Champagne also comes with the car. The nose cone has suffered stone chipping (a common issue on these Spider’s due to the low sloping front). Ideally this Spider would benefit from a respray but it can be enjoyed as is. The Spider sports a nice set of alloys with a set of Michelin tyres all round. A full size alloy spare is in the boot which also has a Michelin tyre. The tyres are also in good condition with a decent amount of thread left. The alloys are in good condition also and they really suit the car. In fact I think they are the best alloy for the S3 Spider. They do have a few marks here and there but they present very well. All the Alfa hub badges are present. The seats are in black leather with a vinyl bead (the seats were originally beige vinyl but were in very poor condition). The door cards are also black as are the door card tops (again these were all originally beige). The carpet is the original orange. It does have some wear, it has faded from the sun in places and there is a split in the drivers foot well. But it is original to the car and I recently treated it to a shampoo and wet vac which has cleaned it up nicely. The convertible hood is in good order. There are a few bits of wear and the back screen does have some scratches. But the important bit is the hood is water tight, the screen isn’t split and the hood cleans up well. A black tonneau cover also comes with the car. Also worth a mention is the fact that the original dealer supplied number plates from Bell and Colvill are still on the car. I doubt there a very few of these converted Spiders that still have the original number plates fitted. So it is a nice little bit of originality there. Once I was finished in the engine bay department I then had the original beige vinyl seats recovered in black leather. These covers actually came with the car, so a previous owner had planned the change but never got around to it. I found the beige vinyl to be too far gone to save and the drivers seat base was ruined. So I had the seats redone and a new drivers base installed as the old one had fallen apart. The beige beading I feel is a nice nod to the cars original interior colour. Next came the door cards. the originals were beige but had been sprayed black. They were old, water damaged and just horrible. So I got a new set of door cards and had the beige top cards redone in black vinyl to match. Other items replaced on the interior were a new gear stick cover. I also replaced the passengers door handle with a correct chrome S3 handle, as the car came with a non matching S4 handle. I also tracked down the correct plastic inserts for the arm rests to replace the home made wooden inserts made by a previous owner. Which were certainly not factory! All of the above has cost in excess of £1,200 and a good deal of my time has gone into it as well. So to sum up my S3 Spider, it is by no means a perfect example. I bought it as a project and I am selling it as an ongoing project. It is an example that has a full MOT, has had a recent service and has a refreshed interior. With tidy examples of the S3 Spider selling for around £10,000 (and the original concours Duetto’s going for £60,000!!! 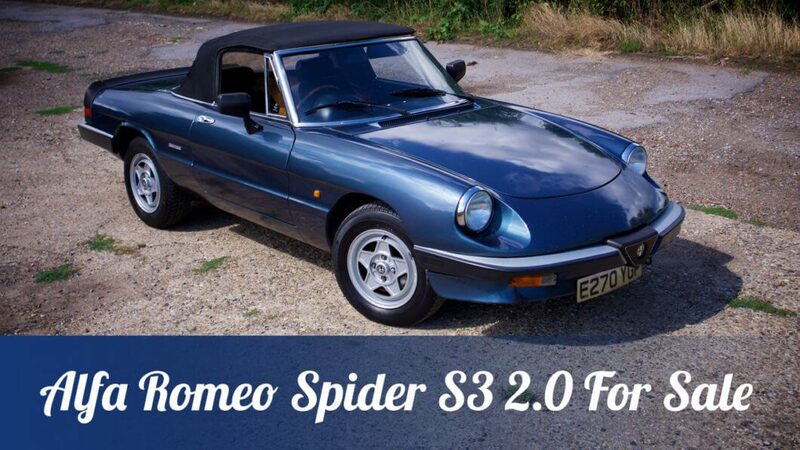 ), this Spider is priced well below restored cars, but just above non running examples. I have seen some non-running S3 Spiders with no MOT advertised for £5,000. This Alfa Romeo Spider S3 has a lot of potential and gives the potential buyer some room for improvement. It is solid and it drives well. It is a very pretty head turning car and I always get comments everywhere I go in it. And with prices of S1/S2/S4 Spiders climbing, now is the time to jump on board and get an S3 Spider. They are on the up and will make a good investment. So there you have it. I would really like my Spider to go to a classic car enthusiast. Or even better, a member of the Alfisti. If you’ve got any questions please do get in touch. I am always happy to have a chat about my Spider. I am open to offers on the car. Sensible ones of course! Drop me an email on hello@taketotheroad.co.uk.